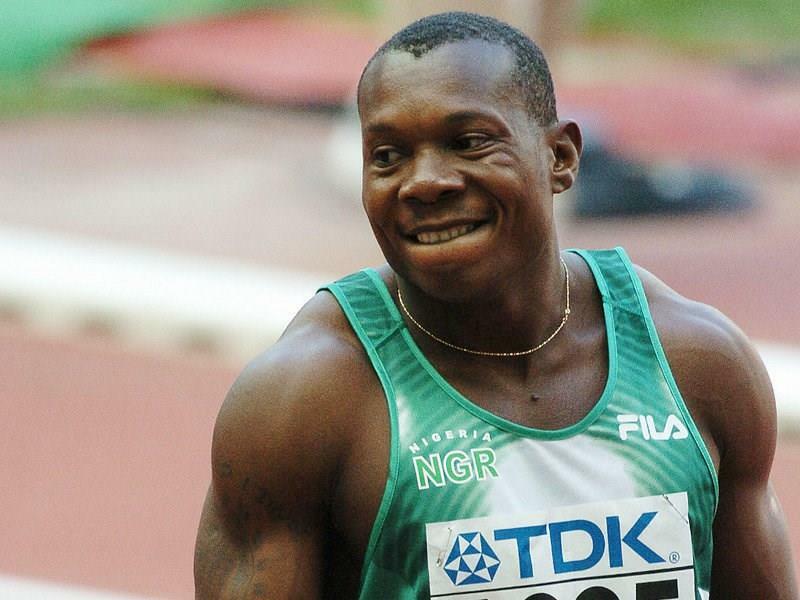 EXCLUSIVE Interview (Part I) with Olympic Bronze Medallist, Deji Aliu, on his Nigeria career! During the recently concluded Ibile Games (Lagos State Sports Festival), Making of Champions Founder, Bambo Akani, sat down with Nigeria’s 60 metre National Record Holder, Deji Aliu, to discuss his time competing for Nigeria, and a brand new Track Club he has set up in Lagos to train athletes. Here is Part I of that Interview – enjoy! Like every other athlete, I started in secondary school and then I went to a certain competition where I met my coach, the late Abel Akhigbe, who invited me over to the stadium, and I started training with him. From there, I was opportuned to compete at the Lagos State Secondary School Games. So I started at a Games just like this Ibile Games (Lagos State Sports Festival) taking place right now. How did you come to represent Nigeria at the International level? My Nigeria career started at the Junior (U-20) level in 1992. I represented Nigeria at the World Junior Championships in South Korea, where we won the Bronze in the 4×100 metres. In ’94, I went to my second World Junior Championships in Portugal, where I won the GOLD in the 100 metres, and Silver in the 200 metres. So you’re a World Junior Champion? Yes, I’m a World Junior Champion. I have 3 medals in total from the World Juniors – GOLD, Silver & Bronze. Tell us about the rest of your Nigeria career. From ’94, I moved over to the Commonwealth Games. Though I was not able to get a medal there, I made it to the finals. After that I represented Nigeria is almost every international competition, from the Olympics to the World Championships, to the World Indoors – you name it. What would you say is the greatest moment of your career? Winning an Olympic Bronze Medal I think is great, but as an athlete running (the 100 metres) under 10 seconds might be greater. I don’t know which is greater, but those are the two greatest achievements of my career. What was your PB in the 100 metres? How many times did you run under 10 seconds? My PB was 9.95 seconds. I achieved that in 2003 when I won the GOLD medal at the All-Africa Games in Abuja. I ran sub-10 seconds three times – the first time was I did it was at a Golden League meet in Athens in 2003, and then the second time was at the National Trials in Abuja, then the third one was the 9.95 at the All-Africa Games. Tell us about that Olympic Bronze Medal ten years ago. If memory serves correctly, that was the last time Nigeria had THREE guys who could go under 10 seconds? The 2004 Olympic Bronze Medal had to do with unity and hardwork on the part of the four or us. We were united, committed, and our spirits were very high. The team was well coordinated, that’s why were able to get something, I wasn’t surprised at all. The four of us (Olusoji Fasuba, Uchenna Emedolu, Aaron Egbele and myself) worked very hard for it. When you got the baton on the anchor leg and you felt Maurice Greene next to you, what were you thinking? I wasn’t thinking anything…on my good day if I get the baton ahead of Maurice Greene, I don’t think he’s gonna beat me, but the thing about the relays is that you’ve got to be very very careful – you’ve got to play safe, stay in the exchange box and watch everything, so I wasn’t really concerned about Maurice, I was just concerned about myself finishing the race in the top 3 positions. What about your exploits in the indoor competition – aren’t you one the fastest athletes in Africa’s history over the 60 metres? Yes, I have the 2nd fastest time in history by an African athlete, 6.48s, which also makes me the Nigerian Record Holder in the 60 metres. My best chance for a medal at the World Indoor Championships was Lisbon in 2001, where I had the 2nd best time going into the final, but I was disqualified for a false start in the final – those were the times when the new rule stating the second (and not the first) person who false started would be disqualified, and unfortunately that was me. Why do you think Nigeria is not producing any Olympic medallists or fast runners anymore? Because we’re not doing a lot of things right. When we were coming up there were camps, regular competitions and the athletes were motivated, but those things are not there anymore. Don’t we have camps right now, for the World Relays and Commonwealth Games? When you talk about camps, it seems like the current definition of camps in Nigeria is different from our definition of camps back then. If you have a camp and it’s not producing anything or making any impact then something is wrong. Why are the camps of today not producing athletes like the camps of before? What they do is this – they usually call the camp about 3 or 4 weeks before the competition starts. That’s not the way it should be done. You can’t bring athletes together for 4 weeks and expect them to perform magic. Short-term camps that are called just before competitions simply cannot produce good athletes. If you want to have a camp to produce great athletes they need to be long-term camps, where you start training the athletes from the build-up period in the pre-season, to the in-season. That’s what we’re not getting right. If we can fix our camps in Nigeria, we will start producing fast athletes again! Tune in next week for the conclusion of the interview with Deji Aliu, where he tells about about the Akhigbe Track Club, which he set up recently to train athletes in Lagos! ← Doha Diamond League RECAP: Nigeria’s Okagbare 2nd in 100m & Bahrain’s Adekoya wins 400m hurdles!